When STAND was founded in early 2004, Britney Spears’ “Toxic,” was released, the final episode of Friends aired on TV, and MySpace was just one year old. 15 years later, a lot has changed – both in student life, and in global human rights advocacy. Along the way, we’ve evolved as well. In the late 2000s, STAND, originally “Students Taking Action Now: Darfur” went multi-conflict, maintaining our focus on Sudan while expanding our vision to include genocide and mass atrocities worldwide. While we believe this was the right decision, it was also impossible to predict the many emerging atrocity events that we would feel drawn to respond to in subsequent years: Sudan and South Sudan, Democratic Republic of the Congo, Burma, Syria, Yemen, Nigeria, Burundi, Cameroon, Venezuela, and more. The list grows ever longer, and yet our organizing model has not adapted to be able to respond adequately to each of these urgent crises. We’ve also found that students’ time is increasingly limited by curricular and financial obligations, and that they are often looking for meaningful ways to effect change as individuals. Within our existing structure, we are limited in our capacity to meaningfully engage passionate and talented students outside of STAND chapters and our Managing Committee apparatus. In recognizing these limitations, we are piloting a new organizational structure that will provide individuals with more opportunities for direct involvement, and give STAND a greater capacity to focus on a wider range of issues. That’s why we are inviting STAND members, alumni/ae, and mentors to take part in STAND’s new issue-based committees, which aim to educate young people on issues related to a specific issue or conflict area, center voices of affected populations, and provide spaces for movement building and political activism on each given issue. We retain our organizational focus on atrocity prevention, civilian protection, and sustainable conflict resolution, and invite all committees to learn about and advocate for these issues in addition to their committee-specific work. The creation of these subcommittees is a step towards strengthening our relationships with both our partners and our grassroots members, democratizing our decision-making, and growing our ability to make tangible political change. We look forward to continuing together to build the next generation of global human rights leaders! Have questions, cool ideas, or want to get involved? 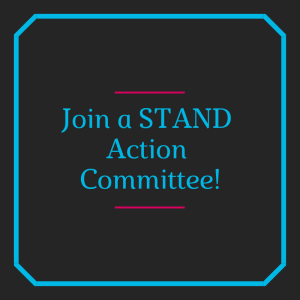 Fill out this form to be connected to the committee(s) of your choosing, or be in touch with us at info@standnow.org!